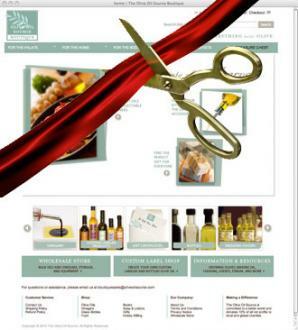 The long-awaited launch of The Olive Oil Source's new online Boutique kicks off today, just in time for harvest season and holiday planning. From practical tools to gift-giving presents, the Boutique is packed with hand-selected, unique specialty products in a wide variety of flavors and sizes. If you are looking for something to complete your kitchen repertoire, check out what’s available in “For the Palate” and “For the Home”. An impressive array of 37 olive oils are offered that range from 8 single varietal extra virgin olive oils to 13 flavored olive oils that explode with a freshness sure to inspire the most discerning chef. Seasonal blends, holiday-inspired, certified organic oils and gift-boxed sets round out the many options. Next, honor your extra virgin olive oils by pairing them with fresh fruit-based or classically aged balsamic vinegars and show them off in the manner they deserve with wonderful serving ideas of ceramic dishes, linen and olive wood pieces in “For the Home”. We’ve learned from our own “Tip of the Month” column by Carol Firenze of The Passionate Olive, that olive oil can be used in all sorts of ways to enhance health and happiness. We selected soap and lotion products from Marius Fabre that we are confident will do just that. You’ll find a soothing line in “For the Body and Mind”. The actual creation of olive oil has always been close to our hearts and so we offer small-scale production help with harvesting and milling products “For Hobbyists”, selected from our many years of experience supplying equipment to larger producers. And of course, if you would like to give a gift for that “oleophile” friend or family member, look no further than “Treasures”. With gift certificates, they are sure to find that part of the fun is just browsing through the Boutique itself.